Network-level objectives: Running a robust data network depends on satisfying objectives for performance, reliability, and policy that can (and should) be expressed as goals for the entire network, separately from the low-level network elements. Network-wide views: Timely, accurate, network-wide views of topology, traffic, and events are crucial for running a robust network. Direct control: The decision logic should provide network operators with a direct interface to configure network elements; this logic should not be implicitly or explicitly hardwired in protocols distributed among switches. Despite the early design goal of minimizing the state in network elements, tremendous amounts of state are distributed across routers and management platforms in IP networks. We believe that the many, loosely-coordinated actors that create and manipulate the distributed state introduce substantial complexity that makes both backbone and enterprise networks increasingly fragile and difficult to manage. In the 4D architecture, we decompose the functions of network control into 4 planes: A decision plane that is responsible for creating a network configuration (e.g. computing FIBs for each router in the network); a dissemination plane that gathers information about network state (e.g. link up/down information) to the decision plane, and distributes decision plane output to routers; a discovery plane that enables devices to discover their directly connected neighbors; and a data plane for forwarding network traffic. Hong Yan, David A. Maltz, T. S. Eugene Ng, Hemant Gogineni, Hui Zhang, Zheng Cai. Proceedings of USENIX Symposium on Networked Systems Design and Implementation (NSDI '07), April 2007. Albert Greenberg, Gisli Hjalmtysson, David A. Maltz, Andy Myers, Jennifer Rexford, Geoffrey Xie, Hong Yan, Jibin Zhan, Hui Zhang. ACM SIGCOMM Computer Communication Review. 35(5). October, 2005. Jennifer Rexford, Albert Greenberg, Gisli Hjalmtysson, David A. Maltz, Andy Myers, Geoffrey Xie, Jibin Zhan, and Hui Zhang. Proceedings of HotNets III. November, 2004. CMU CS Technical Report CMU-CS-05-117, September 2005. Geoffrey Xie, Jibin Zhan, Dave Maltz, Hui Zhang, Albert Greenberg, Gisli Hjalmtysson, Jennifer Rexford. Proceedings of IEEE Infocom 2005. D. Maltz, G. Xie, J. Zhan, H. Zhang, A. Greenberg, G. Hjalmtysson. Proceedings of ACM SIGCOMM 2004. Today, a large body of research exists on the correctness of existing routing protocols. However, analytical frameworks for studying routing dynamics have mostly focused on one single routing protocol instance at a time. In reality, the Internet is composed of, not one (e.g., BGP) but, a multitude of protocol instances that need to interact. For example, routes must be exchanged between BGP and OSPF. The interactions between these protocol instances are governed by the routing glue component. However, despite its wide usage and essential role, there has been no formal investigation into how safe its usage is. We develop analytical models to rigorously analyze the interactions between multiple routing protocol instances, and its impacts on a network-wide level. We show that making routing protocols safe alone is not sufficient to ensure the correctness of Internet routing but the routing glue plays an equally important part: Its usage can result in a wide range of routing anomalies including persistent forwarding loops and permanent route oscillations. This routing glue deserves further attention from the networking community. Franck Le, Geoffrey Xie, Hui Zhang. Proceedings of ACM CoNEXT '08, December 2008. The interactions between routing protocol instances are in fact governed by two procedures: route redistribution permits the exchange of routing information, and route selection allows routers to rank routes received from different instances. We demonstrate that the problem is broader than that of route redistribution alone. Route selection by itself, i.e., the mere co-existence of multiple routing protocol instances, and its interplay with route redistribution can each result in routing anomalies. We show that the routing glue could actually be at the origins of many global disruptions of the Internet connectivity that have been reported but could not be fully explained so far. Franck Le, Geoffrey Xie, Dan Pei, Jia Wang, Hui Zhang. Proceedings of ACM SIGCOMM '08, August 2008. We conduct a large-scale empirical study of the prevalence and usage of the routing glue in more than 1600 operational networks. The evidence show that the routing glue is widely deployed. More surprisingly, we discover that operators depend on the routing glue not simply to interconnect routing instances but also to implement complex design objectives that existing routing protocols (e.g., BGP) alone cannot accomplish. This reinforces the importance of the role played by the routing glue. Finally, we find that actual deployed configurations can be vulnerable to routing anomalies. These results confirm the importance of the problem. Proceedings of IEEE ICNP '07, October 2007. We develop an analytical model to rigorously analyze the impacts of route redistribution, i.e., the exchange of routing information between different routing protocol instances, on a network-wide level. We illustrate how easily inaccurate configurations of route redistribution may cause severe routing instabilities (including route oscillations and persistent routing loops) and we discuss potential changes to the current route redistribution procedure to guarantee safety. Proceedings of ACM SIGCOMM Workshop on Internet Network Management (INM'07), August 2007. We show that existing recommendations put forth by router vendors do not effectively protect against routing anomalies. Configurations of route redistribution, compliant with existing guidelines, can still experience permanent route oscillations and other unacceptable instabilities. Consequently, we propose a set of new configuration guidelines for different targeted objectives. 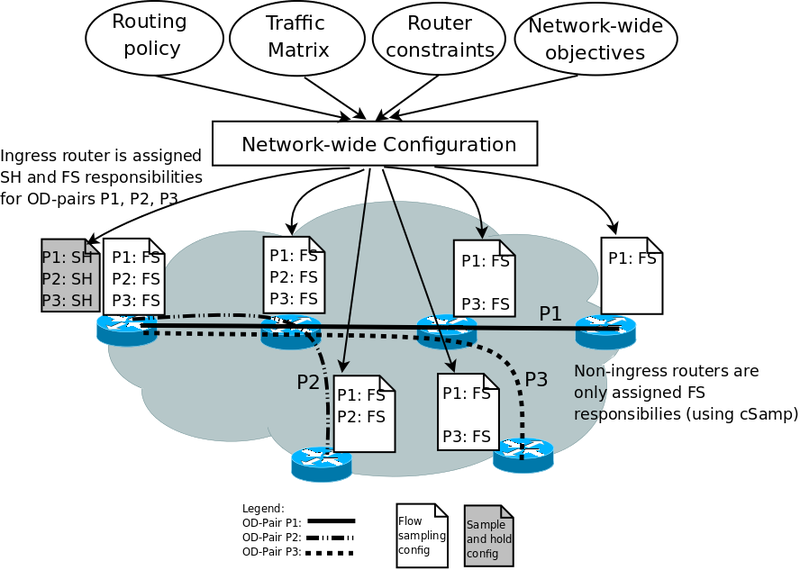 The configuration guidelines consist of sufficient conditions for the usage of route redistribution, and we formally prove that each guideline will prevent the targeted routing anomaly. Computer Science Technical Report CMU-CS-09-132, May 2009. Flow monitoring supports several critical network management tasks such as traffic engineering, accounting, anomaly detection, identifying and understanding end-user applications, understanding traffic structure at various granularities, detecting worms, scans, and botnet activities, and forensic analysis. These require high-fidelity estimates of traffic metrics relevant to each application. The set of network management and security applications is a moving target, and new applications arise as the nature of both normal and anomalous traffic patterns changes over time. We make the case for a "RISC" approach for flow monitoring which employs simple collection primitives on each monitoring device and manages them in an intelligent network-wide fashion, to ensure that the collected data will support computation of metrics of interest to various applications. 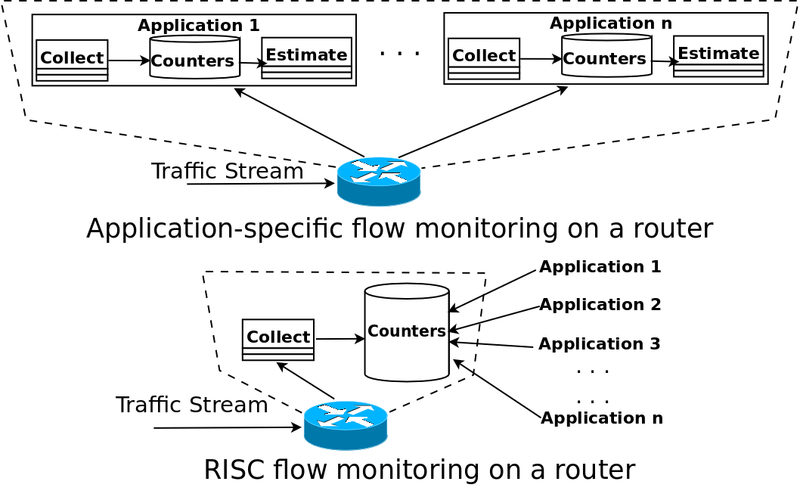 A RISC architecture dramatically reduces the implementation complexity of monitoring elements; enables router vendors and researchers to focus their energies on building efficiently implementing a small number of primitives; and allows late binding to what traffic metrics are important, thus insulating router implementations from the changing needs of flow monitoring applications. This paper addresses the question of whether we need complex application-specific primitives to meet the demands of different flow monitoring applications or if it suffices to implement a small number of "RISC" primitives on routers to get sufficient fidelity across the entire spectrum of applications. This paper describes how to implement cSamp using only local information on routers without requiring global OD-pair identifiers. It provides an immediate and incremental deployment path for ISPs without requiring changes to packet headers or the existing routing infrastructure. This paper describes the basic Coordinated Sampling framework. There are three key ideas: flow sampling, hash-based coordination, and an optimization framework for meeting network-wide flow monitoring objectives while operating within router resource constraints.